Gajalakshmi, or Gaja Lakshmi, is a manifestation of Goddess Lakshmi. She symbolically represents power, strength, grace and authority. She is also referred as Gaj Laxmi – the Goddess of elephants – symbol of fertility. Two white elephants pouring water (abhisheka) upon the Lakshmi with their upturned trunk is the most popular image of Gaja-Lakshmi. 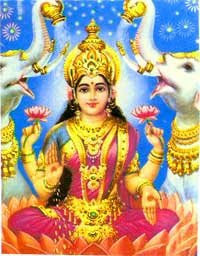 Gajalakshmi is also counted among the Ashta-Lakshmi (eight forms of MahaLakshmi). The two elephants are also believed to have welcomed Goddess Lakshmi when she rose out of the milk of ocean – during Samudra Manthan – by performing the jal abhisheka. A popular belief in Hinduism is that there are eight pairs of elephants standing on eight corners of cosmos holding up the sky. These eight elephants are known as ‘dig gaja.’ The elephants that performed jal abhisheka on Goddess Lakshmi are one of the eight pairs of ‘dig gaja.’ The elephants worshipped her because they realized her power to enrich and nourish the world. And Human beings followed it. Gaja Lakshmi is also one among the Ashtalakshmis and is worshipped for power and strength.